Dance to the sounds of a 1940s style big band this Labor Day weekend and reminisce about a bygone era. The HangarHotel and Conference Center in Fredericksburg, Texas will host a swinging USO Style Hangar Dance on Saturday September 3, 2011. A percentage of the event proceeds will be donated to USO Ft. Hood, which delivers programs and services to more than 40,000 service members and their families. A little rusty on your dance skills? Don't fret; you'll be swinging in no time. Show up early for swing dance lessons from 7:00 p.m. – 8:00 p.m. before local talent, Bill Smallwood and the Lonestar Swing Orchestra takes the stage at 8:00 p.m. They'll take you back to the 1940s with their 18 piece big band, playing until 11:00 p.m. The Pacific Showroom’s Tiki Bar will be staffed and available for patrons to quench their thirst after all that dancing. 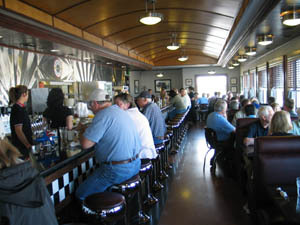 Concession items will be served from the Airport Diner. Attendees are encouraged to wear their best 1940s inspired outfit and participate in the costume contest. So ladies, slap on some red lipstick and pin up your hair to help set the scene for the event. Winners will receive prizes including a gift certificate to the Hangar Hotel and gift items from the Fredericksburg Brewing Company and Fredericksburg Herb Farm. Those donning a military uniform will receive a coupon for a free drink at the front door. Tickets are $20 per person. To purchase tickets in advance or to make room reservations (hurry they’ll go fast) contact the Hangar Hotel at 830-997-9990. Get a $5 discount on your dance ticket with the purchase of two nights at the Hotel. If you can’t make it out Labor Day weekend make plans to attend the USO Style Hangar Dance scheduled for December 31, 2011 (New Years Eve). 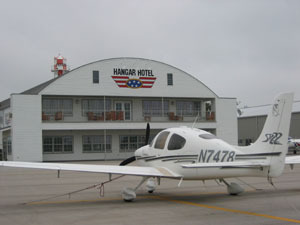 The Hangar Hotel, located adjacent to the Gillespie County Airport, was designed to mimic the look of a WWII airplane hangar, providing the perfect setting for a USO style dance. The hotel is decorated in South Pacific/WWII style complete with palm trees and tiki bar.